A weeping form of L. x watereri 'Vossi' with long, drooping branches. 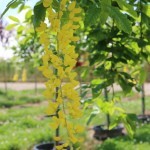 The tree is covered with pendulous racemes of bright yellow flowers in the late spring. The summer color is light to mid green, with yellow fall color. It grows best in full sun to part shade in a rich, medium moisture, well-drained soil. 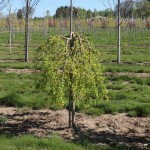 Use as a small specimen tree, allowing space for the form to be admired.